Free spaying/neutering and vaccinating feral cats, through month of April, Community Spay-Neuter Clinic, Freeport. Assistance with traps and trapping provided. Transport available from some areas. For more information, call 865-0772. Sponsored by PetSmart Charities. Regional School Unit 5 public meeting on proposed $27.3 million budget, Wednesday, April 30, 6:30 p.m., Durham Community School. Freeport Day, Wednesday, April 30, Nordica Theatre, 1 Freeport Village Station. Freeport residents can see a movie at no charge. Donations for Freeport Middle School Sports Boosters will be collected. Proof of residency is required. Meet Matt Moorhouse and Cassie, new police dog from the Freeport Police Department, Wednesday, April 30, 6 p.m., Freeport Community Library. Community Night, Thursday, May 1, 6:30 p.m., Freeport Community Center, 53 Depot St. Residents are invited to learn about new programs and services available in Freeport and Pownal. Representatives are scheduled to appear from the Freeport Police and Fire departments, Freeport High School Interact Club, Casco Bay Y Cancer Support Program, Wolfe’s Neck Farm and town of Freeport, among others. For more information, call Freeport Community Services, 865-3985, or see www.fcsmaine.org. “The Mills of the Androscoggin River,” illustrated talk by architectural historian and Topsham resident Scott Hanson, Thursday, May 1, 7:30-9 a.m., Fort Andross Gallery, 14 Maine St, Brunswick. For more information, see www.brunswickdowntown.org. Grades 7-12 band concert, featuring students from Freeport Middle School, Durham Community School and Freeport High School, Thursday, May 1, 7 p.m., Freeport Performing Arts Center, 30 Holbrook St. Program of classic band literature mixed with recent compositions, pop arrangements and traditional marches. Free. Business to Business Connection, Greater Freeport Chamber of Commerce’s business networking group, Thursdays, 7:30-9 a.m., Hilton Garden Inn, 5 Park St. For more information, call 847-5240. Novelist Lily King, author of “Father of Rain” and the new novel, “Euphoria,” book talk and signing, Friday, May 2, 7 p.m., Freeport Community Library. Part of the “Meet the Author” series funded by Friends of the Freeport Community Library. For more information, see www.freeportlibrary.com. Scrapbook weekend, Friday, May 2, 5:30-9 p.m., and Saturday, May 3, 8:30 a.m.-3 p.m., Durham Congregational Church, 773 Royalsborough Road. Door prizes and goodie bags. Beginners welcome. $25 fee includes lunch on Saturday. Proceeds benefit the church’s general fund. To register or for more information, call Pearl Scribner, 353-4030. Freeport First Friday, May 2, 6 p.m. concert by Not Too Shaap, followed by three-course dinner at 7 by Tom Hincks and the Jameson Tavern, Freeport Community Center. Tickets $15 in advance, $20 on Friday. For tickets, call Kim Hudak at Freeport Community Center at 865-3985, ext. 202. Seating limited. “Hello Gorgeous,” Meg Doherty celebrates the golden anniversary of Barbra Streisand’s Broadway debut, Friday, May 2, and Saturday, May 3, 8 p.m., Freeport Theater Of Awesome, 5 Depot St, Freeport. For tickets and more information, call 675-4000 or see www.theaterofawesome.com. Recompence Shore Campground, Wolfe’s Neck Farm, 134 Burnett Road, Freeport. Bring weather-appropriate clothing and footwear; a rake and garden gloves. Volunteers provided free camping Friday-Sunday and some meals. For more information and to RSVP, call 865-9307. Boy Singers of Maine spring concert, Saturday, May 3, 7 p.m., North Yarmouth Congregational Church. Tickets $10, $8 for seniors, $5 students and children. Visit www.boysingersofmaine.org for more information. Spring Bazaar, sponsored by Freeport Woman’s Club, Saturday, May 3, 10 a.m.-3 p.m., St. Jude’s Church, 134 Main St., Freeport, across from Key Bank. Plants, baked goods, gift baskets, attic treasures and collectibles. Proceeds benefit the Freeport Woman’s Club charitable works, including donations to Freeport Community Services, community improvements and educational scholarships. 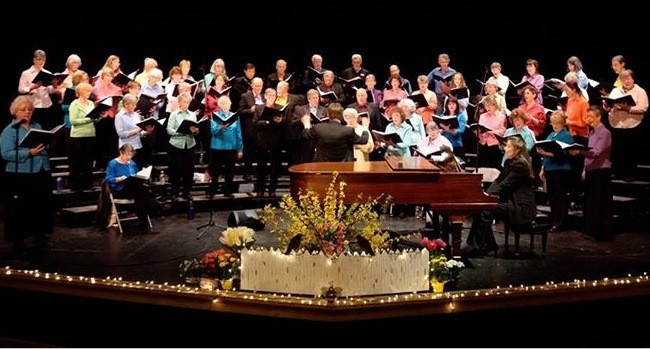 “Sun Moon Stars Rain,” spring concert by Greater Freeport Community Chorus, Saturday, May 3, 7:30 p.m., Tuttle Road United Methodist Church, 52 Tuttle Road, Cumberland, and Sunday, May 4, 2:30 p.m., First Parish UCC Church, 40 Main St., Freeport. Program to feature “The Last Words of David,” “I Got the Sun in the Morning,” “Rain, Rain, Beautiful Rain” and other pieces. Tickets $10 for adults, 18 and under free, per-family maximum of $25. For more information, see www.gfccweb.org. “The Seussification of Romeo and Juliet,” presented by Pine Tree Academy Drama, Saturday, May 3, 8 p.m., at the school, 67 Pownal Road, Freeport. Tickets $5 for adults, free for children 12 and under. Stroll with the Ranger, Saturday, May 3, 2 p.m., weather permitting, Wolfe’s Neck Woods State Park, Freeport. Take a relaxed tour with the ranger on this wheelchair- and stroller-accessible path. Meet at circle of benches by second parking lot. Free with park admission. For more information, call 865-4465.
or call 865-4469, ext. 106. Osprey Watch, Sunday, May 4, 2-3 p.m., weather permitting, Wolfe’s Neck Woods State Park, Freeport. Stop by the osprey sign opposite Googins Island to get a close look at the nesting ospreys. Free with park admission. For more information, call 865-4465. “A Celebration of Spring,” Wescustago Youth Chorale annual spring concert, Sunday, May 4, 4 p.m., Freeport Performing Arts Center. Graduating seniors will be recognized. Reception to follow concert. Tickets at the door $10 adults, $5 students and seniors 65-plus. For more information, see www.wescustago.wordpress.com or call Leigh Palmer, 846-0705. Merriconeag Poetry Festival, Sunday, May 4, 3-4:30 p.m., Merriconeag Waldorf School’s Community Hall, 57 Desert Road, Freeport. Event features renowned poet, Richard Blanco and finalists from 11 area high schools. Free, but pre-registration required. See www.merriconeag.org. Celebrate Cinco de Mayo with Soundwavz, Sunday, May 4, 6-8 p.m., Freeport Theater of Awesome, 5 Depot St., Freeport. Latin rock, reggae and jazz. For more information, see www.theaterofawesome.com. Griefshare Support Group, with video and discussion, runs 11 weeks starting Monday, May 5, 6:30 p.m., Shiloh Chapel Fellowship Hall, 38 Beulah Lane, Durham. For more information, see www.griefshare.org or www.shilohchapelmaine.org. Book signing with Will Russell, co-author of “Rare Birds of North America,” Monday, May 5, 6-6:30 p.m., Freeport Wild Bird Supply, 541 Route 1, Freeport, followed by more conversation, signings and beer, 6:30-8 p.m., Maine Beer Company, 525 Route 1. Part of the “Birds, Books, and Beers” series. For more information, see www.freeportwildbirdsupply.com. Pownal selectmen, Monday, May 5, 7 p.m., Mallett Hall. Yoga for kids, Tuesday, May 6, 10:30 a.m., Freeport Community Library. For toddlers and preschoolers. Durham Board of Selectmen, Tuesday, May 6, 6:30 p.m., Town Office. Pownal Planning Board ordinance review workshop, Tuesday, May 6, 8-9:30 a.m., Mallett Hall. Discovering Buddhism, series that gives students foundational teachings, readings and practices related to Tibetan Mahayana Buddhism, Tuesdays 7-8:30 p.m., Tashi Gatsel Ling, a Gelugpa Tibetan Buddhist Center, 20 Independence Drive, Freeport. All welcome. For more information, see http://tashigatselling.com. Freeport United Soccer Club fall player evaluations, Tuesday, May 6 and Wednesday, May 7, Hunter Road Fields, Freeport. For Freeport, Pownal and Durham children who want to play competitive youth soccer in a league with similar clubs in the Casco Bay and Mid-Coast regions. Times are: 4:30 p.m., U9 to U10 boys and girls; 5:30, U11 to U12 boys and girls; 6:30, U13 to U14. boys and girls. For information on player minimum requirements, see www.freeportunitedsoccerclub.com. Rain dates May 13 and 14. Freeport Town Council, Tuesday, May 6, 6:30 p.m., Town Council Chambers. Freeport Planning Board, Wednesday, May 7, 6 p.m., Town Council Chambers. Durham Planning Board, Wednesday, May 7, 7 p.m., Town Office. Regional School Unit 5 public meeting on proposed $27.3 million budget, Wednesday, May 7, 6:30 p.m., Freeport High School. Screening of “Philomena,” Thursday, May 8, 1 p.m., Freeport Community Library. Freeport Shellfish Conservation Commission, Thursday, May 8, 6 p.m., Freeport Community Center. Talk on HPV, how you get it and how to prevent it, with Dr. Elizabeth Linnel, obstetrician/gynocologist, Thursday, May 8, 5:30 p.m., Corinne Croteau Lepage Women’s Health Pavilion, 330 Sabattus St., Lewiston. To register, call 777-8458. Joshua L. Chamberlain Civil War Round Table Lecture, Thursday, May 8, 7 p.m., Curtis Memorial Library Morrell Room, 23 Pleasant St., Brunswick. Speaker: Jim Hessler, “Sickles at Gettysburg.” Lectures are free and open to the public. Novelist Eleanor Morse, author of “White Dog Fell from the Sky,” book talk and signing, Friday, May 9, 7 p.m., Freeport Community Library. “Robin Hood,” presented by Puppet Showplace, Friday, May 9, 7 p.m., and Saturday, May 10, 2 and 7 p.m., Freeport Theater of Awesome, 5 Depot St. For more information, call 675-4000 or email deb@theaterofawesome.com. To purchase tickets, see www.theaterofawesome.tixato.com/buy. An Evening of Praise & Worship, to benefit the Lisbon Area Christian Outreach Food Pantry, Friday, May 9, 7 p.m., Shiloh Chapel, 38 Beulah Lane, Durham. All are invited for an evening of music, Scripture, and testimony praising God. Non-perishable food item(s) and/or money accepted as food pantry donation. For more information, call 353-2434 or see lacopantry.org. The Theater Project benefit auction, Friday, May 9, 6 p.m., the Brunswick Hotel and Tavern, 4 Noble St., Brunswick. Area merchants, craftsmen, restaurants, and other establishments and organizations have contributed a variety of items for silent and live bidding. Tickets $20. Purchase at theater box office, online through www.theaterproject.com, or at the door. Pine Tree chapter of SPAAMFAA, (Society for the Preservation and Appreciation of Motorized Firefighting Apparatus in America), meets Saturday, May 10, 1 p.m., Bickford Collection museum, Yarmouth Junction, off East Elm Street in Yarmouth. Members will learn about Erv Bickford’s extraordinary collection and tour the trucks. Guests welcome. For more information, contact Thornton Ring, 865-6143. Casco Bay Walk, Saturday, May 10, 2 p.m., weather permitting, Wolfe’s Neck Woods State Park, Freeport. Enjoy views of islands and rocky shores on this one-mile walk along the Casco Bay trail. Meet at circle of benches by second parking lot. Free with park admission. For more information, call 865-4465. “Robin Hood,” presented by Puppet Showplace, Friday, May 9, 7 p.m., and Saturday, May 10, 2 and 7 p.m., Freeport Theater of Awesome. Steamer Dig, Sunday, May 11, 2 p.m., weather permitting, Wolfe’s Neck Woods State Park, Freeport. Learn about the life and times of the soft-shell clam. Then try your hand at digging this delicacy of the deep mud. (Bring mud sneakers or high boots and clam hoe or spading fork.) Meet at circle of benches by second parking lot. Free with park admission. For more information, call 865-4465. Novelists Christina Baker Kline and Kate Manning talk about the writing process, Monday, May 12, 6:30 p.m., Freeport Community Library. Durham Solid Waste Committee, Monday, May 12, 6 p.m., Mallett Hall. Music with Buster B., Tuesday, May 13, 10:30 a.m., Freeport Community Library, for toddlers and preschoolers. Durham Historical Society meets, Tuesday, May 13, 6 p.m., Old Town Hall. Parkinson’s Support Group, second Wednesday of the month, May 14, 1-2:30 p.m., Bay Square at Yarmouth, 27 Forest Falls Drive (opposite the post office). Ongoing monthly support group meeting for people living with Parkinson’s disease. Walk-ins welcome. Medicine Buddha Pujas, held monthly at 7 p.m. on date of full moon, May 14, June 13, Tashi Gatsel Ling Gelugpa Tibetan Buddhist Center, 20 Independence Drive, Freeport. All welcome. For more information, see http://tashigatselling.com. Pownal Planning Board public hearing, Wednesday, May 14, 6 p.m., De Witt Room, Mallett Hall. Review of reformatted and updated drafts of the road and zoning ordinances. Craft and vendor fair, Saturday, May 17, 8 a.m.-4 p.m., First Congregational Church, UCC, 773 Royalsborough Road, Durham, held in conjunction with Bulky Waste Day. Fair features local crafters, vendors, farmers, musicians, a cheese sale, pie sale, silent auction, raffles and more. Coffee and muffins available early, grilled cheese for lunch. To rent a table, call 353-2464. Public lunch, Friday, May 2, 11:30 a.m.-1 p.m., North Yarmouth Congregational Church, 3 Gray Road, North Yarmouth. Homemade haddock chowder and desserts, a monthly special, and grilled sandwiches. Takeout available. All proceeds benefit the church’s local and global community. Bean supper, Saturday, May 3, 5-6:30 p.m., Casco Lodge, 20 Mill St., Yarmouth. Three kinds of beans, macaroni and cheese, hot dogs, coleslaw, homemade pies and biscuits, and beverages. $8, $4. Freeport Elders Association Pancake Breakfast, first Saturday of each month, May 3, 8-10 a.m., Freeport Community Center, 53 Depot St. Breakfast includes pancakes, sausages, coffee or tea, juice, $3.50 for adults, $3 for seniors, $2 for children 12 and under. Deluxe breakfast is scrambled eggs, pancakes, sausages, biscuit, coffee or tea, juice, $4.50, $4 for seniors. Baked bean and spaghetti supper, Saturday, May 3, 4:30-6 p.m., North Pownal United Methodist Church, 851 Lawrence Road. Three kinds of beans, spaghetti with meat sauce, potato salad, cole slaw, biscuits and brown bread, pickled beets and assorted homemade pies. Adults $7, children 4-12 years $3, free for 3 and under. The Greater Freeport Community Chorus will perform “Sun Moon Stars Rain” Saturday, May 3, at the Tuttle Road United Methodist Church in Cumberland, and Sunday, May 4, at the First Parish Church Congregational in Freeport.